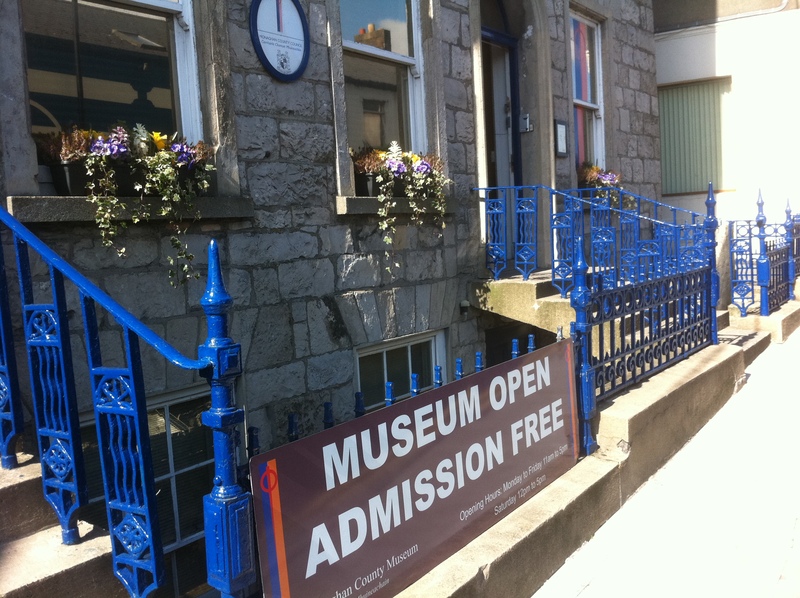 A scheme to help local and regional museums in Ireland to carry out small projects to improve their displays and make them more attractive for tourists has been approved by the Minister for Arts, Heritage and the Gaeltacht, Heather Humphreys T.D. The 2015 Local and Regional Museums Scheme is designed to support small and medium-sized museums across the country. This year, the scheme will allow for the funding of small capital projects on a matched funding basis (75:25). A total fund of 0,000 is being made available for suitably qualified museum development projects. Projects funded under the Scheme should seek to enhance the cultural offering of museums; to encourage greater access to museums and to promote the use of museums as tourism resources in their locality or region. 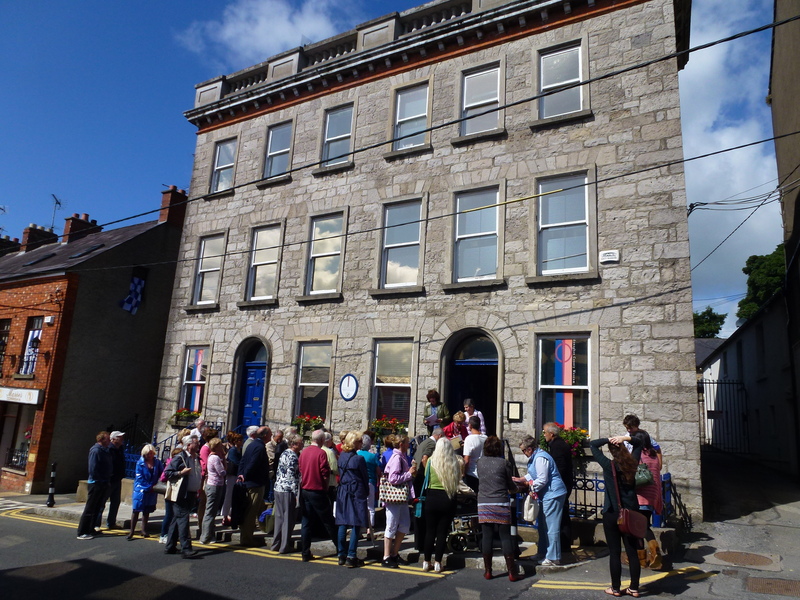 Monaghan County Museum opened in 1974 becoming the first full time, local authority funded and professionally staffed museum in the country. The first Curator was Aidan Walsh. During its history it has seen many social, cultural and political changes both at a local and national level. These diverse changes are reflected in the museum’s collection of artefacts and displays. The museum staff headed by curator Liam Bradley are dedicated to the goal of ensuring that all its exhibitions and events are accessible to everyone. It has received many awards during its existence. 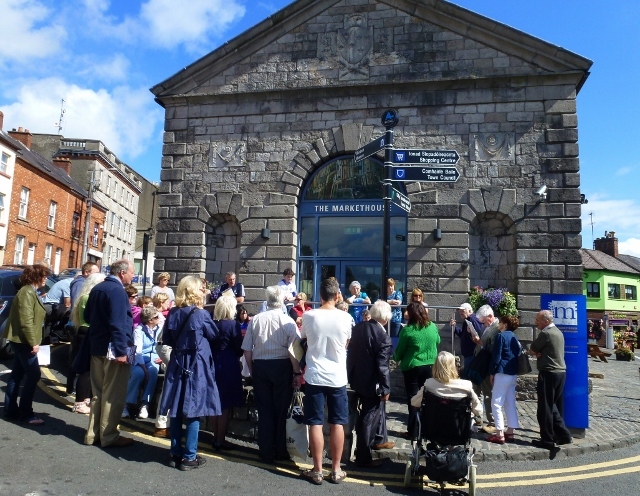 It was the first Local Authority Museum in the country to achieve full accreditation under the Heritage Council’s Museum Standards programme for Ireland. 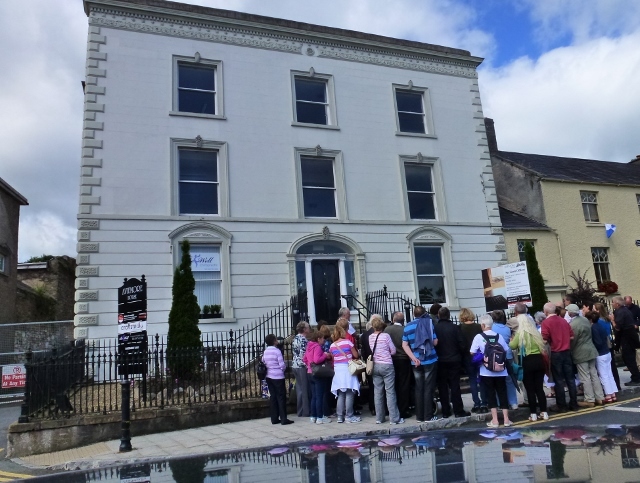 This was a very worthwhile process for the museum to be involved in and was a huge testament to the commitment of the museum staff as well as the tremendous support received from Monaghan County Council and the Museum’s other stakeholders including the Museum Advisory Committee that Monaghan County Museum is now officially recognised as one of the most professionally run museums in the Republic of Ireland. Many years ago I interviewed Charles Friel for a ‘Northview’ programme on RTÉ Radio about railway heritage especially the old Great Northern Railway. 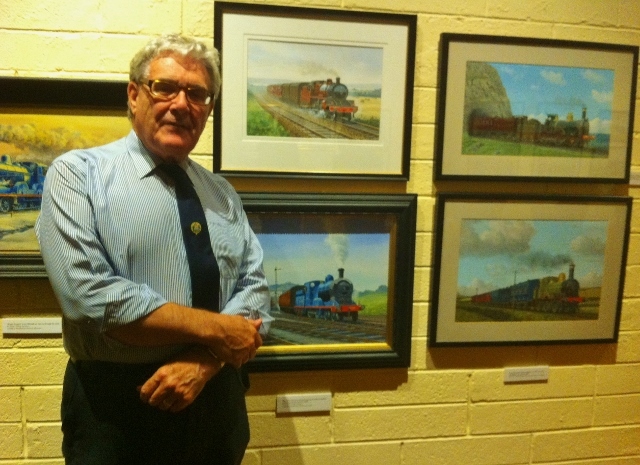 Tonight he was giving a talk in Monaghan County Museum about the railway in County Monaghan. 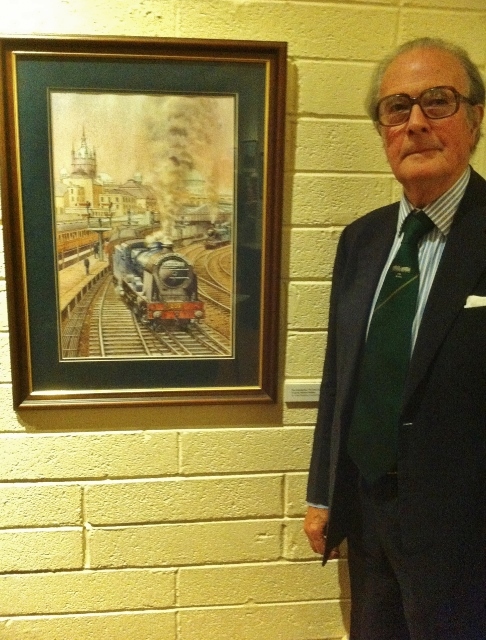 The talk coincided with the opening of an exhibition of railway paintings, the majority of which are on loan from Lord O’Neill of Shane’s Castle, Randalstown and President of the Railway Preservation Society of Ireland. Opening the display, he told the audience he would shortly be celebrating his 80th birthday with a trip on a special steam train excursion from Belfast! 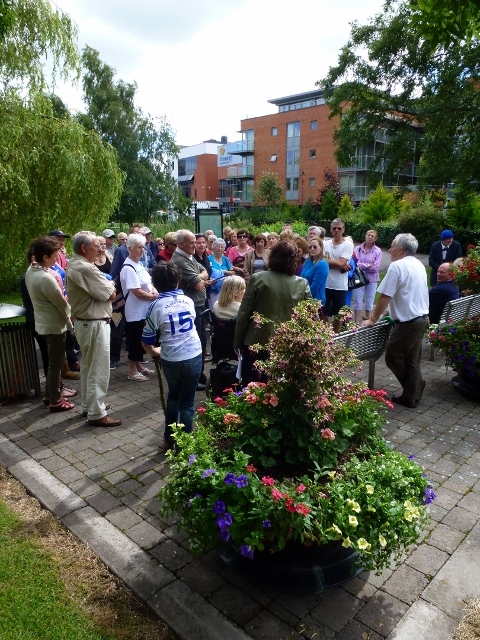 Day two of the 22nd annual William Carleton international summer school was devoted to a walking tour of Monaghan town. 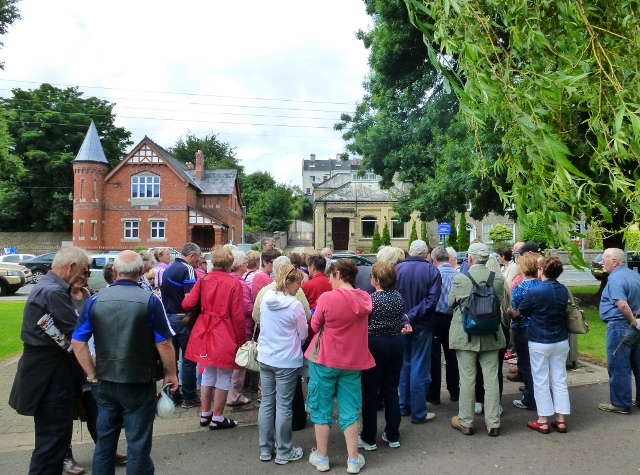 Around fifty people took part and were guided around some of the important buildings in the town by Grace Moloney of the Clogher Historical Society, based in Monaghan. 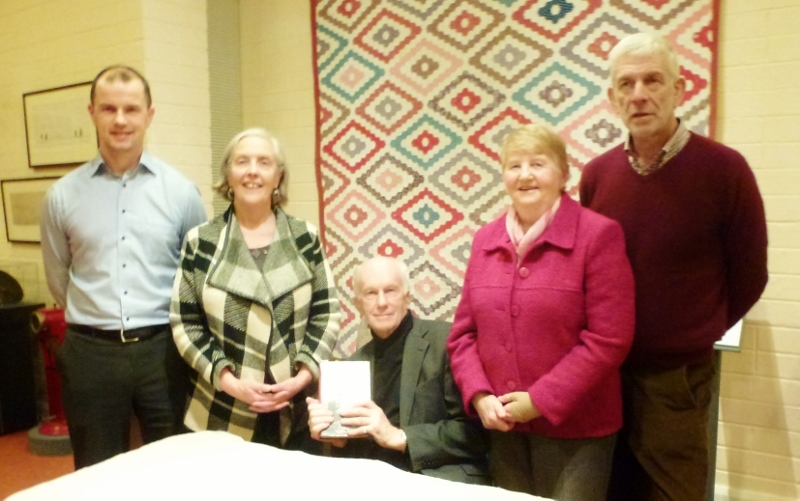 She has researched, written and lectured extensively about local history in the Clogher Diocese. 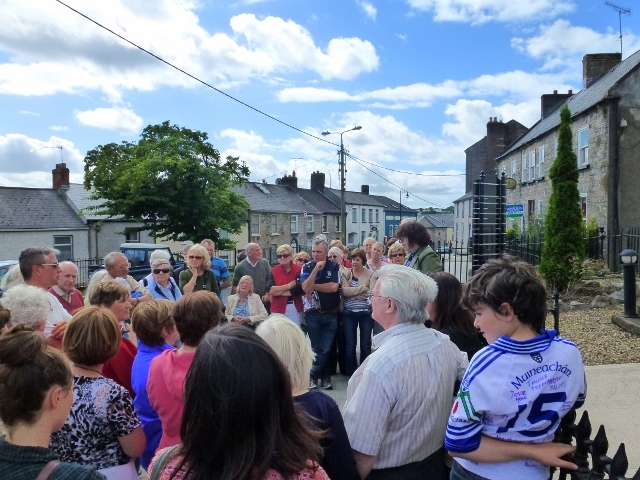 Her main interest is the history of County Monaghan, especially maps, place-names, archaeology, natural history (forests and bogs), social history and the history of women. 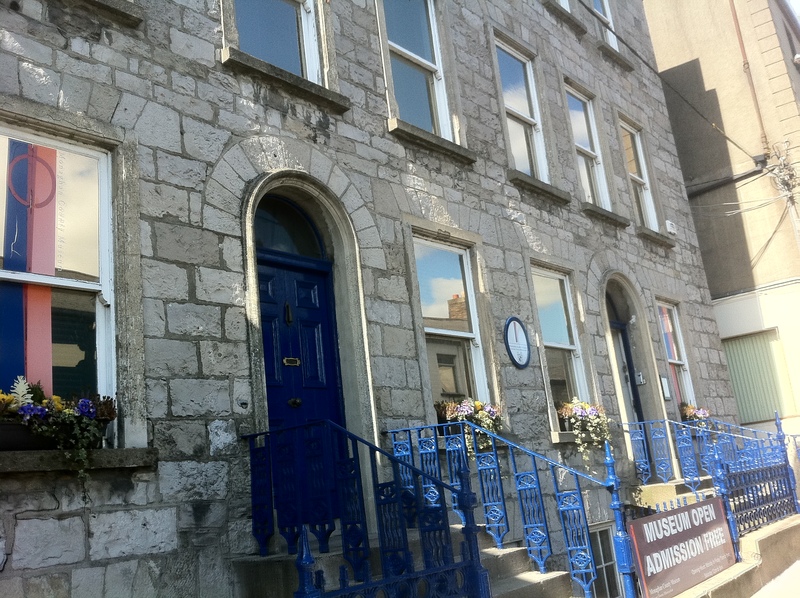 She was assisted by Theresa Loftus of Monaghan County Museum, where she has been working since 2004. Initially she worked in registration, moved to education and outreach and became Exhibition / Research Officer in 2007. 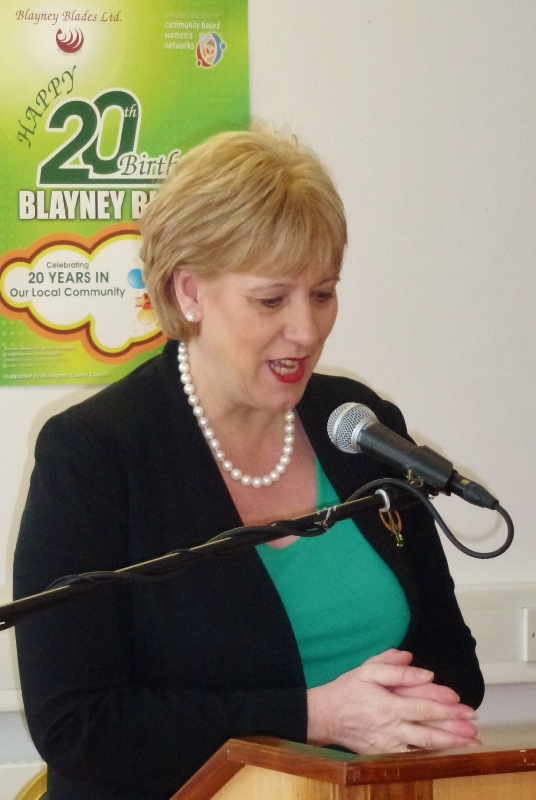 She studied Local History in NUI Maynooth and Museum Practice and Management at the University of Ulster. The tour took began at the Museum at Hill St beside Park St (site of town gate, the Market House, Aviemore – home of land agent Dacre Hamilton, reputedly the inspiration for Carleton’s Valentine McClutchy – site of 1602 building – tunnel). It then went via Mill St (the town’s first mill) to North Road (possible site of holy well, beheading of friars c1540, Orange Hall) and St Peter’s Lake (associations with ‘Honest’ Peter McPhillips a class-mate of Carleton at Fr John Keenan’s classical school), legend about two lakes. 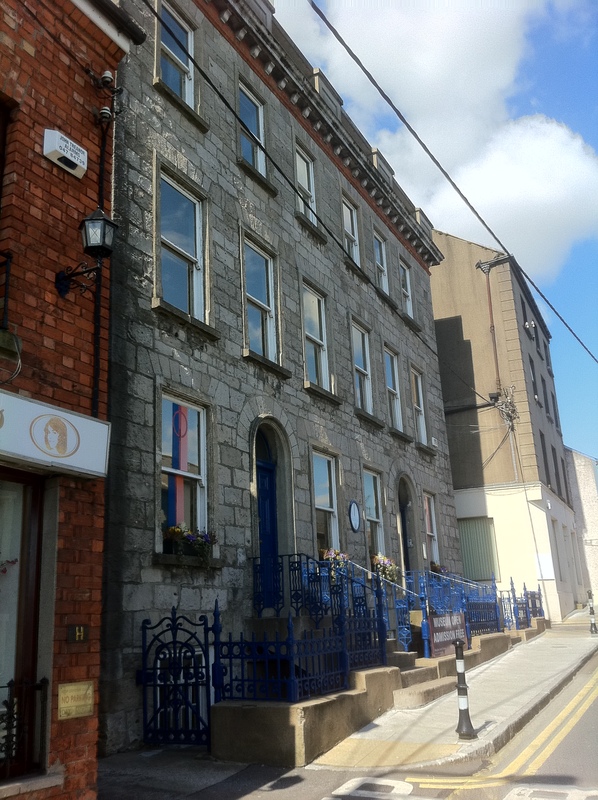 The group then walked along Glaslough St (early bowling green, RIC barracks, Masonic hall) to The Diamond (Bleckley’s school & past pupils, Westenra Hotel and memorial and mausoleum) and along Dublin St (birthplace of Charles Gavan Duffy who featured in yesterday’s conference, Baird’s pub, Orange Hall, site of town gate) and on to Old Cross Square (Presbyterian Meeting House, Market Cross, Shambles, canal, Monaghan abbey) then to the rear of the Courthouse (Plantation castle and main entrance into the Diamond, fishponds, oldest buildings in the town) and into Church Square (Courthouse, coat of arms, bomb memorial, jail (Johnny Short’s hotel), St Patrick’s Church of Ireland, Bram Stoker, Westenra family, Dawson memorial, Hive of Knowledge). Lunch was served afterwards at the Poc Fada pub where a group of traditional musicians entertained the group. Sunday 4th August: Tomorrow in Monaghan town republicans from all over Ireland will gather for the national hunger strike commemoration, the story of which is on display at an exhibition organised by Sinn Féin in Dublin Street. 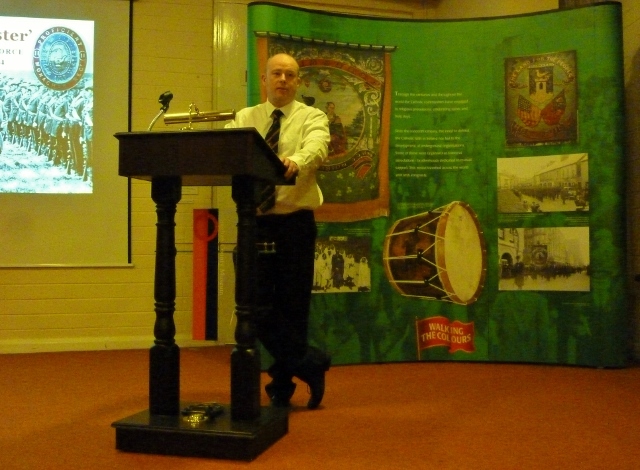 A very interesting night on Wednesday at Monaghan County Museum, where the CaDoLeMo group that promotes orange bands and culture in the border counties of Cavan, Donegal, Leitrim and Monaghan held a talk on the two rival sets of Volunteers that emerged in the early 1900s before partition. It was an appropriate setting as the museum is currently displaying the Walking the Colours exhibition, which I wrote about in April. Quincey Dougan spoke about Monaghan unionists, in particular their contribution to the formation of the Ulster Volunteer Force. For a more detailed look at the subject, you can find his article on the subject here. One of the flags included in the exhibition comes from the 2nd Battalion of the UVF in Monaghan, which Quincey explained had its headquarters in Clones under the command of Lt Colonel Madden of Hilton Park outside the town. After the outbreak of World War I, Madden was replaced by a prominent solicitor Michael Knight, also Grandmaster of the County Orange. According to Dougan, in August 1913 it was listed as having just 408 men, but within 12 months it had became bigger than the first battalion with 1058 men enlisted. The main drill areas were Drum, which included Scotshouse, Corrygarry, Drum and Carn; Clones including Clones, Stonebridge and Drumully, and Ballybay which included Laragh and Aughnamullen. Newbliss had a section, as did Dartrey in the form of Doohat and Dartrey. 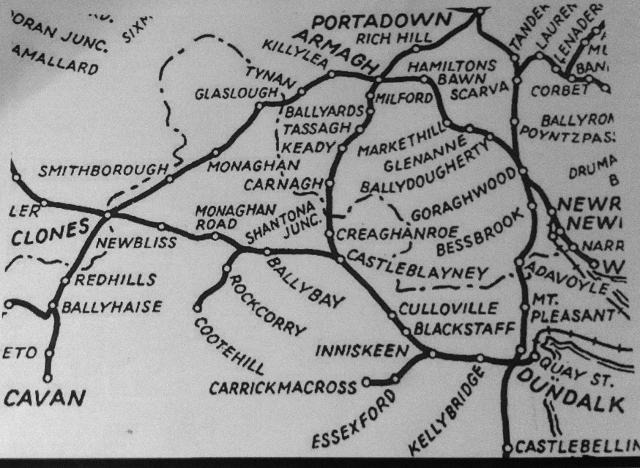 The Castleblayney and Carrickmacross area was not listed on the original returns and appears to have been slow to organise, but by early 1914 it also had men drilling. The Mullyash area of East Monaghan had a large unionist presence, but its natural hinterland was the South Armagh town of Newtownhamilton and it appears that the area drilled with County Armagh. The second part of the evening was devoted to the story of the Irish Volunteers in County Monaghan. 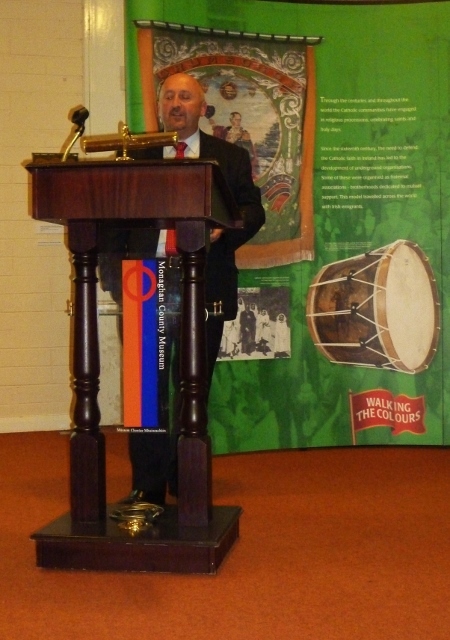 The guest speaker was Professor Terence Dooley, NUI Maynooth, who comes from Killanny near Carrickmacross. 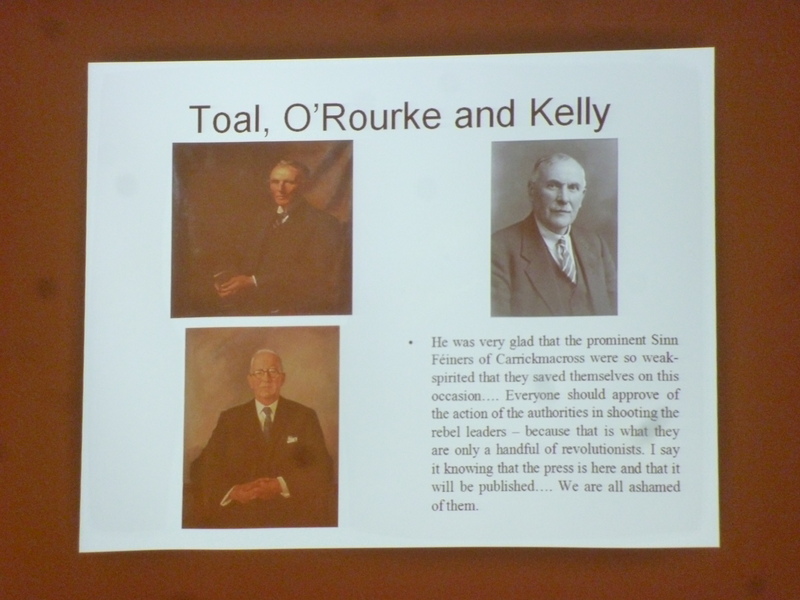 It was fascinating to hear the story of three Monaghan nationalists who went on to become politicians, Thomas Toal of Smithborough, Edward “twister” Kelly and ? O’Rourke. This orange banner comes from Redhills in County Cavan. 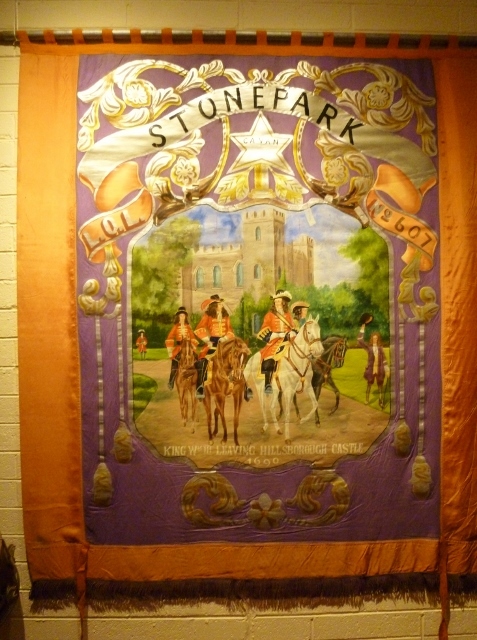 It belongs to the Stonepark Lodge No.607 and depicts the departure of King William III (of Orange) from the original Hillsborough Castle in County Down in 1690. An unofficial history of the Irish Campaign explains how he had landed at Carrickfergus a few days earlier and on 19th June 1690 at Hillsborough the King “issued an order…granting Presbyterian ministers in Ireland the right to receive the regium donum, an annual grant, paid to nonconformists ministers in England, Scotland and especially Ireland at that time. The payment was made as a reward for their loyalty to him and partly as compensation for their recent losses“. The following month the crucial Battle of the Boyne took place against the forces of James II. On the reverse side is a picture of Lisburn Cathedral. This suggests that the banner has been re-used by a different orange lodge. 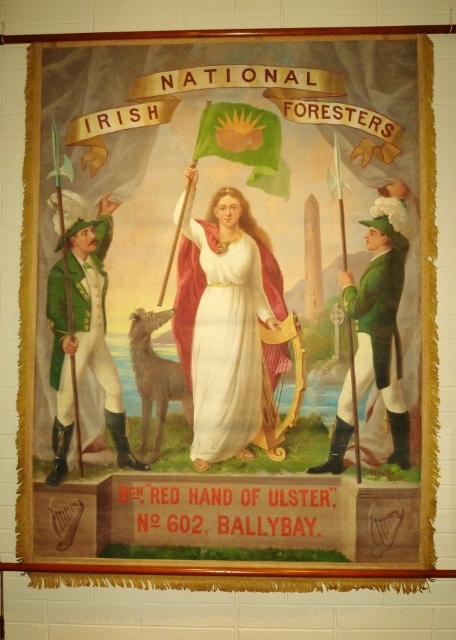 The banner is part of “Walking the Colours“, a touring exhibition currently at Monaghan Museum and running until the end of July. 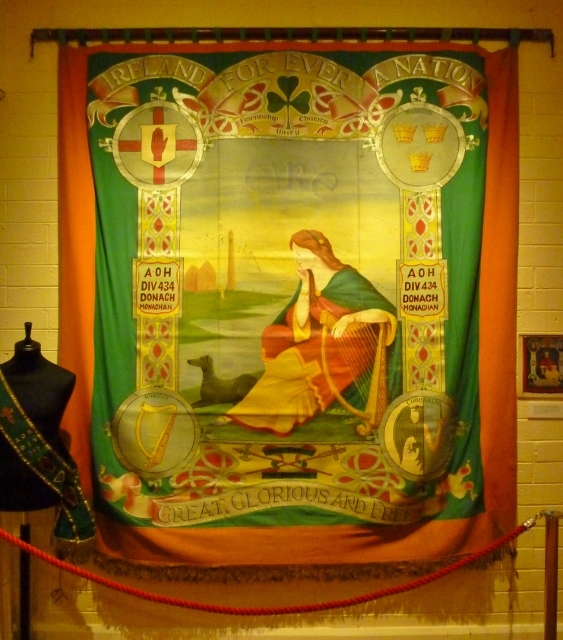 Colour is the operative word as there is a varied selection of banners and sashes from both the orange and green traditions. 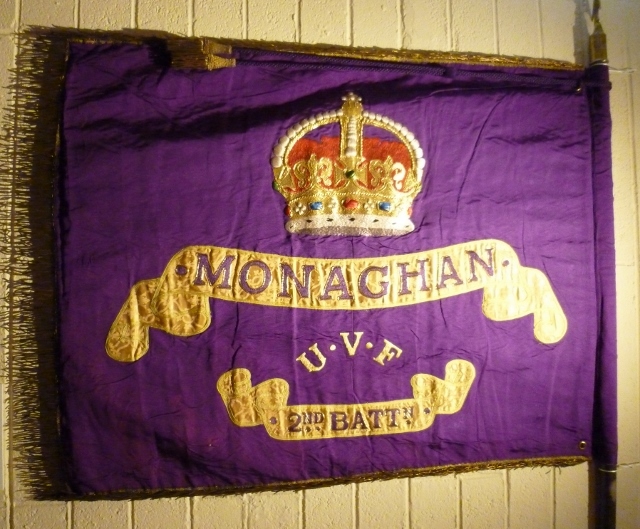 With all the current controversy about UVF centenary flags flying in East Belfast, I was interested to see an original flag of the Ulster Volunteer Force in Monaghan dating back to the period around 1912/13. 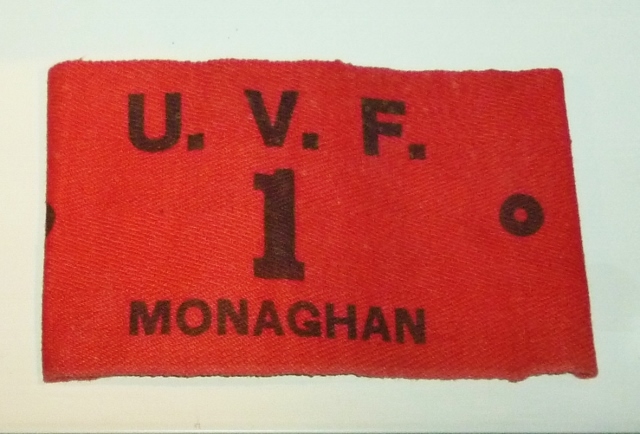 There was also a UVF armband from the same era. 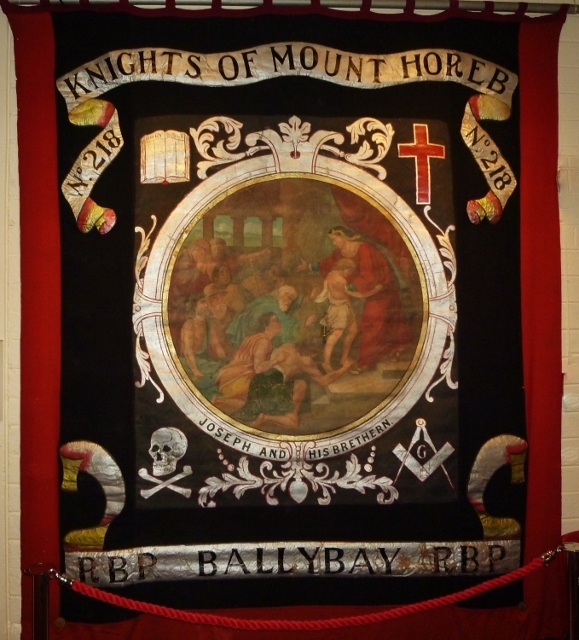 To complete the display of banners from the Protestant tradition, there is one belonging to the Royal Black Preceptory in Ballybay, named the Knights of Mount Horeb. Biblical scenes were common (and still are) in the black and orange loyal order banners. The teachings of the Royal Black Institution are based on Holy Scripture. 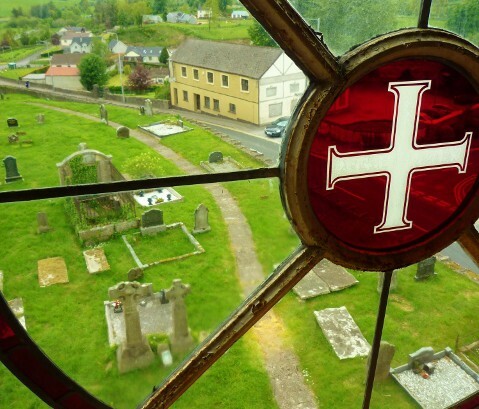 The organisation was founded in 1797, two years after the Orange Order came into existence. There are two Royal Black District Chapters in Monaghan and fourteen Preceptories. Donegal is the only Ulster county not represented. On the nationalist side, there are several local banners of significance. They include one of Terence Bellew MacManus from Tempo, County Fermanagh. 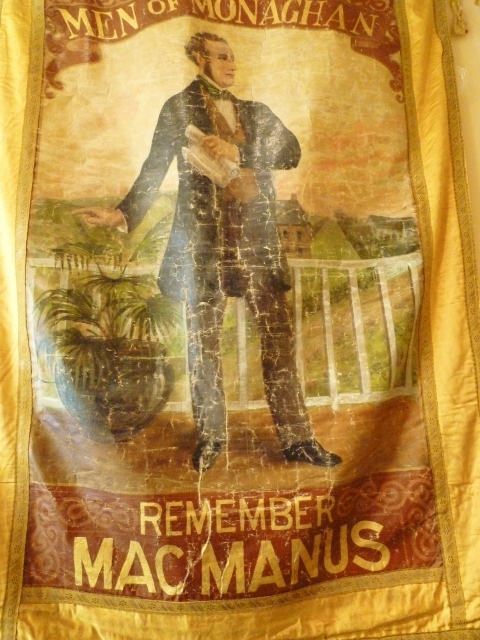 The slogan exhorts Men of Monaghan to “Remember MacManus”, who took part in the Young Irelander rebellion in 1848. He is buried in Glasnevin cemetery in Dublin. 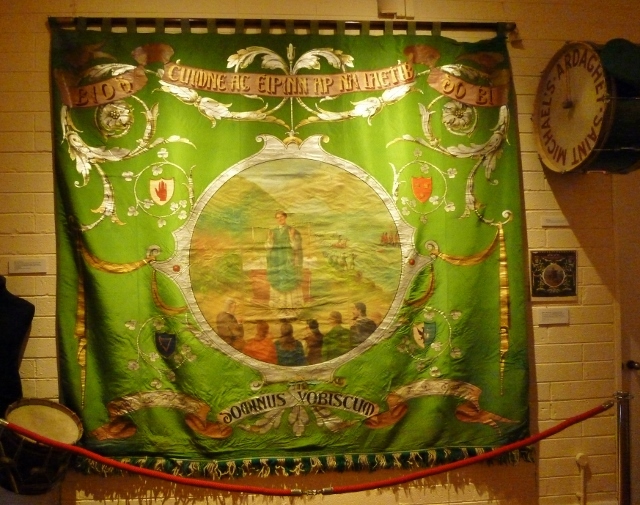 The banner is thought to have been made in the early 1900s. 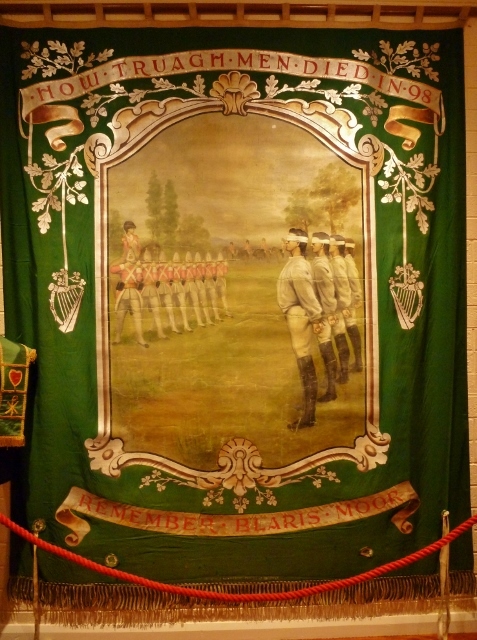 It was brought to the USA and used by the Monaghan Mens’ Association in the St Patrick’s Day parade in New York. There is a picture of it accompanying the group in 1933. 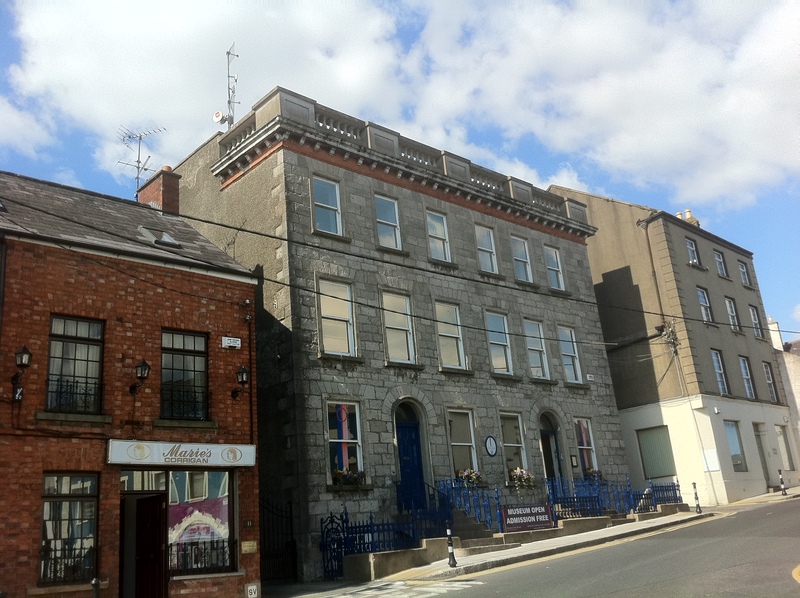 The Ancient Order of Hibernians was set up in 1838 as a counter to the Orange Order. Division 434 was the designation in Donagh parish, in North Monaghan.